You either love her or hate her…..who you ask? well Ivy of course, personally I love her here is a small selection from our garden. Well are you a fan or are you not? Next post: A FEW HIGHLIGHTS FROM OUR GARDEN. Definitely - you have a great selection there. 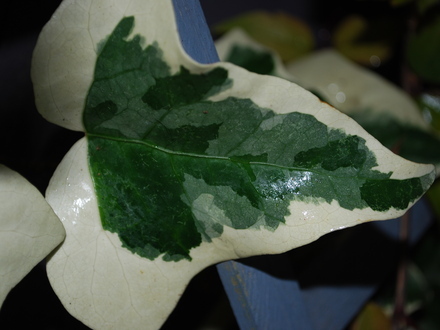 I have some growing in garden beds as well as hanging baskets - especially love the variegated ones. love the variegated ones where does the marmite come in? I like that as well! 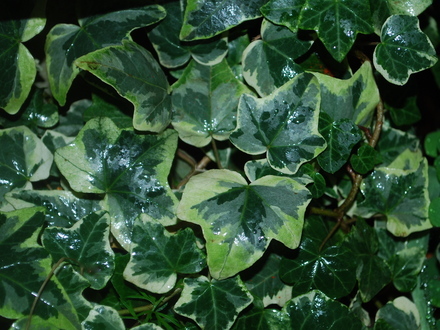 I like ivy, and you have some lovely ones aswell. Thanks all, Gee once they get their feet down they will romp away. Amblealice it was raining the whole time I was out with the camera. They are all hiding ugly features, I give the big ones a hair cut in the spring, and rake out all the dead leaves. Luv 'em - up my trees, over my fences, ground cover - got 'em all. What's the second one with the red leaf stems? - it's a cracker! love ivies but hate marmite. I like the 2nd to last one the most. do you know which one it is? I dont like ivy when it takes over a garden and chokes every thing in its path but I do like ivy when it behaves.Its nice covering a tree trunk and trellis and I know birds and insects need it but when you see it wrapped around roses, campanulas etc its a real turn off.I even found it in my kitchen cupboard via the air brick.Ihave a needle point one which is growing and behaving nicely on my back fence. I'm all in favour of ivy when it is controlled...any variety.....I have two boundary walls completely clothed in the stuff.....feet thick and a welcome haven for the bird-life etc.....great! Definately a fan . I'm always buying pots of them and puting them to fill in around the sides of pots, or with bulbs etc. You have a good selection there. 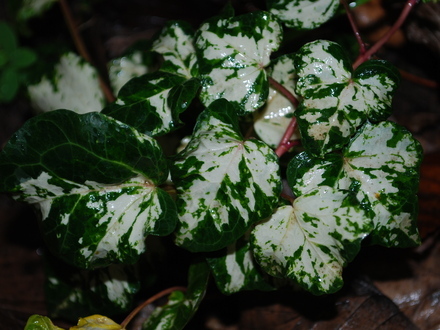 Lovely ivy DD - I love the one with the white edges. I'm after an ivy called, I think, Erecta. I saw it in a garden centre but didn't buy it and have regretted it ever since! Not seen it anywhere since. It doesn't climb but grows upright so a bit different. Gee used to have it in our old garden, it was most unusual, you could get it online I am sure. Will put some of the names on when I can find my list lol watch this space. I love them too! AND marmite! Mad I might have guessed you would like Marmite.......I loath it give me Bovril any day!!! Its Bovril for me too Madperth. So pleased to see most of you grow ivy, there are so many beautiful varieties about now, and you can always pull it down, Mavis what a shock to find it in the cupboard!!! Fluff it rained most of the day....for a change!!!!!! I keep it mostly on the fence panels, it gets a trim every year in the spring. 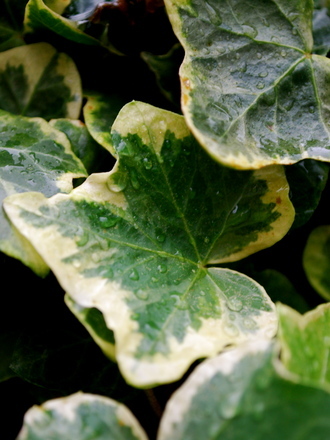 I do like most Ivys and have several - but I HATE Hedera Colchica 'Sulphur Heart' when it comes over from next door's garden and swamps everything in its path. The day my neighbour offers to prune it, hell will freeze over. :-(((((( He didn't like a small tree I had growing about a metre away from the fence so sprayed it with weedkiller. What a pig (sorry pigs) thank God we have really nice neighbours, that is not on is it? 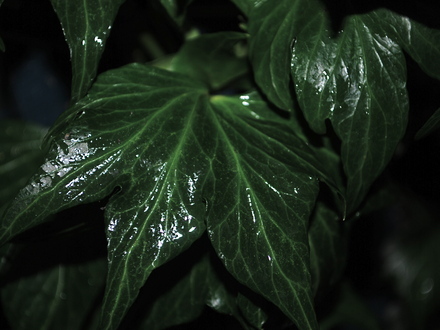 What is that beautiful ivy, second picture? Fibrex is certainly a great site, have not bought from them, please let me know what the quality is like, £2.00 is very reasonable. Thanks Janey, I only put a few ivies on, as you can see by the pics it was a very wet day, so gave up. Oh nooooo not pelargoniums too, what are you doing to me Ba, now when is my Birthday? Oh...Lol! Ba....Just had a look at the Ivies....it's a bit difficult finding the ones you want to look at...Lol! Dotty......your pic no 1. 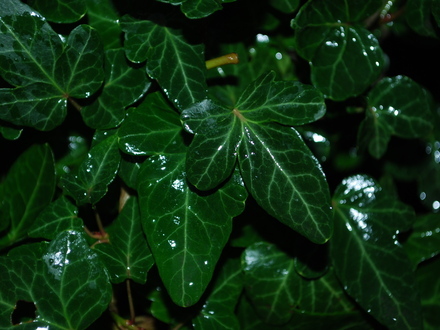 ......I think is the Irish Ivy, Hedera Hibernica. you haven't finished your makeover yet.....Lol!